My body's quite shattered these days, but my mind still works... So there I was, on the sofa with the sun shining outside, neighborhood kids screaming in the background, scratching my head trying to figure out what's going on the menu for our National Day on Friday. I have to admit that non alcoholic beer was consumed today, redneck style. 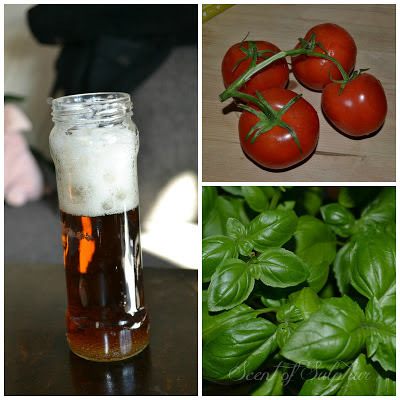 ;P Gonna make some homemade pesto & BBQ sauce for Friday, hence the basil & tomato pics. I ended up planning a proper BBQ with homemade coleslaw & potato salad...& I found a few recipes on yummy cakes too. Oooh, & I'm definitely going nuts with the whole red, white & blue decor for once. The only thing I'm not looking forward to is the amount of cleaning I have to endure by Wednesday. But it'll get done...in snail pace. After that it'll just be a breeze with the food preparations. Really looking forward to a huge tub filled with ice & beverages, loads of flag waving & friends dropping by.